In the context of the healthy printing initiative the question arose how to view MOSH/MOAH especially in printing inks in the Cradle to Cradle framework. The following paper summarizes facts about MOSH/MOAH. In the media the topic of mineral oil in food originating from printing inks came up again and again since approximately 2010, recently in Oeko Test, a widely distributed journal (1), which evaluated the mineral oil concentration in chocolate and found mostly MOSH. Since certain toxicological effects of MOSH/MOAH are known, an avoidance or at least minimization strategy is required. This paper outlines facts and the status of the ongoing discussion. For POSH, there is very little information on properties and toxicology so these are not subject of this paper. In 2009, the German Bundesintitut fuer Risikobewertung (BfR) mentioned for the first time the issue of migration of MOSH/MOAH into food, based on investigation results from Switzerland. In 2012, the German ministry Bundesministerium für Ernährung und Landwirtschaft (BMEL) published a study, which resulted in the statement that packaging made of recycled cardboard inevitably needs a barrier layer. The European Food Safety Authority (EFSA) developed a comprehensive scientific opinion in 2012, updated 2013. Hydrocarbons: Substances consisting of carbon, hydrogen and oxygen, naphthenic or cyclic, including PAHs (polyaromatic hydrocarbons). Hydrocarbons can also be synthetized by chemical methods from other starting substances than mineral oil. Chemically and toxicologically, these have to be treated like MOSH/MOAH from mineral oil. MOSH: Mineral Oil Saturated Hydrocarbons. MOAH: Mineral Oil Aromatic Hydrocarbons, mostly 1-4 or 5 ring systems. Suspected carcinogenic ingredients: especially MOAH with 3-7 ring systems. Subject for investigations: MOSH/MOAH with < C25, no migration expected by longer C-chains (2). The EFSA states that absorption by the body, however low, is possible up to C26-C29 and becomes negligible at C35. POSH: Polyolefin Oligomeric Saturated Hydrocarbons and alkenes (POMH – Polyolefin Oligomeric Mono-unsaturated Hydrocarbons Hydrocarbons). Mineral…: Origin from the earth. Mineral oil: Hydrocarbons originating from earth. Oils in general: The term “oil” is also in use for fatty substances consisting of esters of fatty acids and alcohols, usually glycerine. This term should not be mixed up with “mineral oil”. Wax: materials defined by their mechanical/physical properties. Animal- or plant-based waxes: Mixtures, mostly esters of aliphatic long chain primary alcohols with fatty acids. Synthetic waxes: Produced from mineral oil sources, main component paraffines, to be assessed like MOSH. Mineral oil hydrocarbons (technical grade) mainly consist of two fractions. Food grade MOH are treated in a way so that MOAHs are minimized. Both fractions consist of carbon chains having generally fewer than 25 carbon atoms, the aromatic systems generally contain 1-5 aromatic systems. Molecular weight, chain length, type of ring system of the mineral oil depends on the location where the sample has been taken. An exact definition of the molecules in the mixtures is not possible. 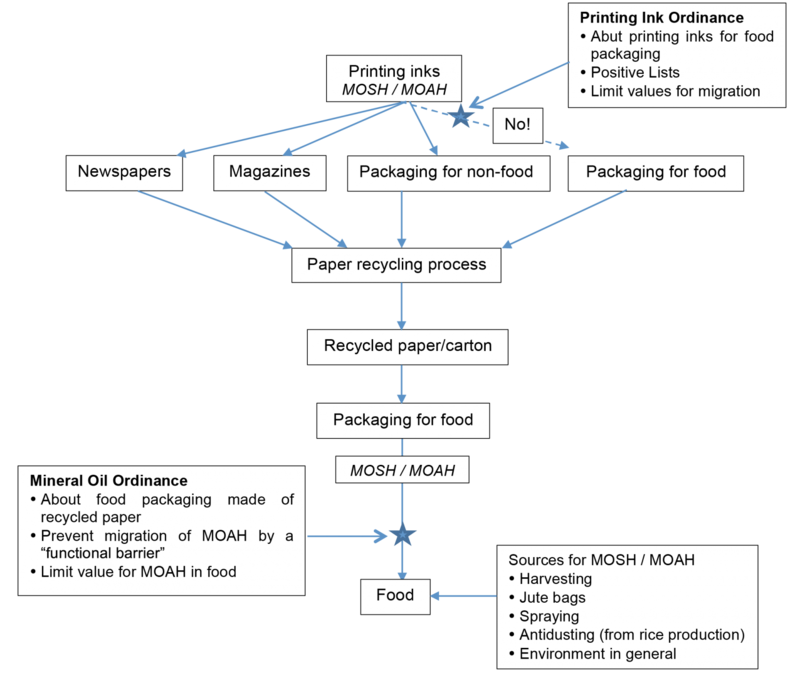 One factor of food contamination by MOSH and MOAH is migration of content from recycled paper products which are used for food packaging. The average concentration of MOSH in unprinted recycled paperboard from Switzerland and Germany was reported as 338 mg/kg of carton, for MOAH 97 mg/kg. For hydrocarbons, some adverse effects were observed. Generally to be expected according to animal testing is Pneumonitis, effects on the central nervous system (CNS), ocular and respiratory irritation. Short length MOSH are absorbed and stored in the body (liver, lymphatic system), causing adverse effects. Estimations (EFSA) for daily intake: Between 0.03 and 0.3 mg of saturated hydrocarbons (MOSH) are absorbed per kg of body weight (children higher). Are absorbed and can bioaccumulate in humans. MOSH of C16 to C35 may accumulate and cause microgranulomas in several tissues including lymph nodes, spleen and liver. Absorption of alkanes with carbon number above C35 is negligible. It cannot be ruled out that aromatic compounds contained in the MOAH fraction could cause cancer or may be mutagenic. Especially MOAH with three or more aromatic rings, non- or simple-alkylated, therefore are of potential concern. Estimations (EFSA): The quantities of aromatic hydrocarbons (MOAH) absorbed daily could be between 0.006 and 0.06 per kg of body weight. In addition to the migration of mineral oil into food, photoinitiators (e.g. in certain UV ink products) and plasticisers (e.g. in certain barriers layers and other plastic surfaces) were found to migrate as well. Status July 2017: Limit values were planned in the frame of an update of the ordinance “Bedarfsgegenständeverordnung”, but not yet implemented on European or German level. Reason: Analytical issues. Still an issue: Possible MOAH limit values were only planned for MOAH originated from packaging from recycled paper. Currently there seems to be no planned regulation for MOAH from other sources. Discusses approximate values for carbon chains of C10 to C18. For C>20 only recommendation for minimization or - better - total avoidance. Guideline value for temporary migration threshold for MOSH in food 12 mg/kg for hydrocarbons of C10–C16 (2011), 4 mg/kg for C17-C20 (2012) (9), guideline value for MOSH with chain length of C20 in discussion. For > C20 only minimization requirement due to possible accumulation in the body (see above). For MOAH there are not sufficient data for development of limit values. Due to the possible carcinogenic potential of MOAH strict minimization is required, no migration of MOAH into food shall be accepted. This statement of BfR is supported by an investigation of the EFSA. In the EU the ordinance no. 1935/2004 is the general regulation instrument for materials coming in contact with food. Currently, there is no particular EU-regulation for food packaging made of waste paper. In Germany, there are two ordinances available as drafts. Besides this the BfR gave some recommendations. Note: The German term “Bedarfsgegenstände“ (consumer goods) describes items which come into contact with food, cosmetics and/or people. Items coming in contact with food are called “Lebensmittelbedarfsgegenstände”. All these materials are regulated and controlled, because adverse effects by releasing toxic substances into food have to be avoided. This ordinance is still at a draft stage, but meanwhile notified by the EU. It is striving for positive lists for printing inks and distinguishes between inks to be printed on food packaging with direct food contact and on packaging without direct food contact. The substance lists encompass monomers, polymers, additives, pigments, solvents, colorants and photoinitiators, several substances under certain restrictions. Table 1 (appr. 600 substances) of the ordinance lists “allowed” substances for printing inks used in printed consumer goods in form of a Positive List. Many of the substances with direct food contact are connected to certain migration limit values. For substances not related to defined migration limits a general value of 60 mg/kg in food for migration is applied, if no other restrictions are defined in table 1 or 3. A lot of substances is related to significant lower migration limits, for instance like 0.05 mg/kg or even “not detectable”. For printing inks which are not in direct food contact different regulations are applied: Other printing chemicals as listed in table 1 are allowed if not qualified as CMR (cancerogenic, mutagenic, reprotoxic) substances according to EU regulation 1272/2008 and if migration is not detectable. Table 2 lists additional pigments which can be used for printing of consumer goods which are not in direct contact with food. Table 3 describes limit values for migration mainly of substance-groups. Table 4 lists migration limits for some metals and primary aromatic amines. A comparison to Cradle to Cradle shows that the selection criteria for substances are not similar. The catalogue of “allowed” substances is related to certain limit values for migration (in mg/kg food) and some other restrictions. A short random check of the lists reveals the presence of potential x-substances according to Cradle to Cradle on table 1 and 2 (e.g. tin-organics, photoinitiators and pigments (chlorinated and azo-pigments cleaving off cancerogenic amines)). Regarding photoinitiators only very few were listed, unfortunately not the innovative polymeric photoinitiators. Hydrocarbon resins (hydrogenated), produced with mineral oil or synthetic hydrocarbons from clean olefins or cracking products by polymerization and hydrogenation followed by subsequent processing. Made of hydrocarbons from tar or petroleum. Currently used among others as additives for printing inks. Refined waxes, made of mineral oil sources or synthetic hydrocarbons. Average molecular weight at least 500 Da. The content of hydrocarbons with less than 25 carbon atoms is limited to 5 %. For another quality of waxes the molecular weight is at least 350 Da with a limit for hydrocarbons with less than 25 carbon atoms to 40%. This type is not to be used in direct contact with fatty foods. White mineral oils, highly refined oils based on hydrocarbons from mineral oil sources. Molecular weight at least 480 Da. The content of hydrocarbons with less than 25 carbon atoms is limited to 5 %. Whether there is a relevant exposure depends on the product and its composition and cannot predicted here. This ordinance is also still in a draft status and is dealing only with MOAH. The target is to prevent migration of MOAH from packaging made of recycled paper and used for food consumer goods into food. For this purpose the ordinance requires so called „functional barriers“. Examples for suitable materials are aluminium, several plastics like PET or PA as layer or additional bag. Exceptions are accepted under certain restrictions. This Mineral Oil Ordinance intends to make sure that no MOAH migrates into food. It defines a limit value of 0.5 mg/kg food (detection limit) for MOAH which proves that no migration happened. It should be noted that mineral oil from printing products on waste paper is not the only input pathway, see also point 6. This aspect is criticized, because the draft ordinance only deals with possible contaminations by printing inks and neglects other sources. As mineral oil containing printing inks are restricted for food packaging, MOSH/MOAH contaminations may arise from other sources like non-food packaging. Chemical issue: MOSH and MOAH are classes of chemicals with hundreds of members which differ in their toxicological properties and cannot be sufficiently separated and quantified by analytical means. There is no standardized analytic procedure yet. Currently, the analyses are carried out according to the methods of DIN EN 00275247, compendium of BfR and Cantonal Laboratory Zurich. The procedures encompass steps from extraction to identification by GC/HPLC, with FID detector, followed by MS. Hence the analytics of MOSH and MOAH is a challenge due to the big variety of substances within these substance classes. In a typical gas chromatogram these are shown as “humps” without separation of the particular hydrocarbons. With two-dimensional gas chromatography combined with an FID detector the characterization can be improved. An additional task is the separation of hydrocarbons originated from food. This can be done by pre-separation with activated aluminium oxide or epoxidation of olefins. Mineral oil containing printing inks which go through the paper recycling process and end up in recycled paper or cardboard, coming from printed waste paper. Especially printed newspapers are known to be printed with mineral oil containing printing inks which is not removed in the paper recycling process. Lubricants from the machinery in food production. Environment in general, e.g. exhaust gas from incineration processes or industry. Using mineral oil free printing inks. Using mineral oil free oils in the supply chain. Stopping the utilization of recycled cardboard for food packaging (partly implemented already). Preferring virgin paper or cardboard. In this respect the discussion is ongoing whether recycled paper would be better from a sustainability point of view. For efficiency methods barriers like PP, PE, aluminium, PET can mitigate or stop the migration. Disadvantage: Recyclability may be negatively affected. A cooperation between „Bundesverband der Deutschen Süßwarenindustrie“ and its „Lebensmittelchemisches Institut“ is working on research about intake, analytics and solutions for mineral oil contamination of food. For initiatives in legislation see point 5.